On Wednesday at 11am, final entries were taken and post positions were drawn for the 143th running of the $2 million Kentucky Derby (G1). A full field of 20 three-year-olds will go 1 1/4 miles on Saturday at Churchill Downs. 22 horses were entered, with Royal Mo and Master Plan getting in as also eligibles who can draw in the race if there are scratches by 9am Friday. Churchill Downs uses the traditional double-blind draw to select the post positions. After the numbers were drawn by Director of Racing Ben Huffman and Assistant Racing Secretary Dan Bork, handicapper Mike Battaglia announced the morning line. Breeders' Cup Juvenile (G1) champion Classic Empire is the 4-1 morning line favorite out of post 14, off his win in the Arkansas Derby (G1). Julien Leparoux gets the call for trainer Mark Casse. Two horses are at 5-1 second choice. Always Dreaming drew post 5 for trainer Todd Pletcher. He comes here off a 3 race win streak including the Florida Derby (G1) for his final prep. John Velazquez will be in the irons. Brian Hernandez Jr. will be aboard McCraken in post 15 for trainer Ian Wilkes. He won his first 4 starts including the Kentucky Jockey Club (G2) as a juvenile at Churchill Downs, but was 3rd in the Blue Grass (G2) last out. Below is the field listed in post position order with morning line odds. Be sure to click the link on each horse's name to view full info, stats, and a photo where available. A star next to the dosage index indicates a dual qualifier. You can check the latest weather forecasts here. Currently the outlook is not good, with rain predicted for Friday and Saturday, but hopefully that will change for the better as we get closer to raceday. The Kentucky Derby will be televised on NBC from 4:00-7:30pm EDT but you can watch most of the Derby card on NBC Sports Network from 12:00-4:00pm. 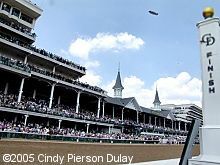 Free past performances for the Kentucky Derby are available here and will be available here. (scroll down to find the Derby horses for the link). The Kentucky Derby goes off at 6:24pm ET, carded as Race 11 of a 14-race card on Saturday May 6th. 2017 Kentucky Oaks Entries - A field of 14 plus one also-eligible was entered with Paradise Woods from post 4 as the 5-2 favorite. Thursday Kentucky Derby Photos - Get photos and notes for 16 Derby and 7 Oaks horses from a wet and cool Thursday morning, including Girvin for the first time plus Classic Empire and McCraken. Wednesday Kentucky Derby Photos - Get photos and notes for 20 Derby and 9 Oaks horses from Wednesday morning or schooling in the paddock, including Always Dreaming, Classic Empire, and McCraken. Tuesday Kentucky Derby Photos - Get photos and notes for 14 Derby and 10 Oaks horses from Tuesday morning or schooling in the paddock, including Classic Empire and McCraken. Bonus horse: American Cleopatra, Pharoah's little sister. Review: Triple Crown Handicapper 2017 - by Jim Mazur. Includes lots of stats for all 3 races and explains how to use a system of statistically derived negative angles to eliminate the "bad" picks. Revamped for 2017 with updated info. Triple Crown Trail - 2017 prep race schedule with results updated weekly. Security even tighter - if you are going to the Derby or Oaks be sure to check here to find out what you can bring in with you. The enhanced security means no big cameras, camcorders, big purses, or coolers. Check here to make sure you don't bring anything they will confiscate. Also there will be no re-entry if you leave the track, so don't forget anything! 2017 is likely to be the same if not more restricted. 2017 Triple Crown Nominations - 419 horses were nominated by the January early deadline. Experimental Free Handicap - Ranks the top 2-year-olds for 2016 and determines the dual qualifiers for the 2017 Kentucky Derby. Kentucky Derby Future Wager - This year there are 4 pools starting in November of 2016 plus a single pool for the Oaks.